A large proportion of the population all over the world consumes acetylsalicylic acid (ASA: aspirin) or other nonsteroidal, antiinflammatory drugs (NSAIDs). This is associated with a considerable morbidity and mortality. Elderly patients, patients with prior history of peptic ulcer disease (PUD) or its complications, those who require high doses of NSAIDs and those undergoing concomitant therapy with corticosteroids or anticoagulants, are at particularly high risk of developing gastroduodenal injuries and related adverse reactions. Gastroduodenal mucosal injuries induced by NSAIDs vary from subtle microscopic to gross macroscopic changes including ulcers. These injuries are induced by both topical and systemic actions of NSAIDs. Inhibition of gastroduodenal cyclooxygenase (COX) enzyme by NSAIDs is considered to be a major pathogenetic factor. Reactive oxygen species (ROS) appear also to play a significant role in the pathogenesis of mucosal injury. Withdrawal of NSAIDs is preferably the first therapeutic option; however, it is not feasible in the majority of patients. Therefore, several drugs including antisecretory drugs (ASDs-proton pump inhibitors and Histamine-2 receptor antagonists) and misoprostol, a prostaglandin analog are used for the prevention and treatment of NSAID-induced gastroduodenal injuries. Among ASDs, proton pump inhibitors (PPIs) are the most commonly used drugs. The antiulcerogenic effect of PPIs is similar to that of misoprostol and superior to standard doses of histamine-2 receptor antagonists (H2-RAs). The adverse effects of m,isoprostol such as diarrhea, abdominal pain, nausea, flatulence, headache, dyspepsia, vomiting, constipation, abortifacient and teratogenicity limit its general use. Aside from their antisecretory action, PPIs also possess an antioxidative effect. PPI maintenance is recommended in chronic NSAID treatment in those with an increased risk of complications and is more effective than Helicobacter pylori eradication. Low PPI dosage maintenance is as effective as a standard dosage regimen. The effect of H. pylori eradication remains controversial. It is advocated in naοve NSAID users, in chronic users with recent ulcer or ulcer complications and in those with an increased risk of ulcer and ulcer complications. In addition, some herbs have shown inhibition of gastric mucosal damage experimentally induced by necrotizing agents through their antisecretory and antioxidant properties. Background: Gastric malignancy is one of the most common causes for cancer-related deaths. Reports from the west have shown a paradigm shift in the site of occurrence with malignancies of the gastric cardium increasing in frequency, reports which are contrary to information from the Middle East and South Asia. Aim: To determine trend changes in distribution of gastric malignancy between 1989 and 2004 in the southern state of Tamil Nadu in India. Materials and Methods: The study period was divided into four cohorts of four years each (1989-1992, 1993-1996, 1997-2000 and 2001-2004) for the analysis of the changes in trend for subsite specificity, age and gender predilection. Results: Clinically, there were no significant differences in the presenting symptoms or physical signs in the four cohorts. The antrum was the most common site of predilection, no site-specific change was noted and males continued to be more commonly affected of the two sexes. Gastric cancer was significantly higher above the age of 40 years in all the four subsites and cohorts. 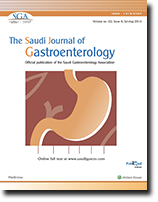 A decrease in the mean age was observed for men with cancers of the esophagogastric junction (OGJ) ( P < 0.0001) and the proximal stomach ( P < 0.0001), while junctional malignancy ( P < 0.0001), cancers of the proximal stomach ( P < 0.0001) and the antrum ( P = 0.03) tended to occur progressively later among women. Conclusion: No change in site specificity or gender predilection for gastric adenocarcinoma has been noted in the past 16 years. However, a gender-dependent paradigm shift in the mean age of presentation is discernible for cancers involving the OGJ, proximal stomach and antrum. Background: The existing conventional liver function tests (LFTs) are indirect, inferior and have limited prognostic value. Therefore, the monoethylglycinexylidide (MEGX) test, which provides a direct measure of the actual functional state of the liver, is proposed as a real-time liver function test. 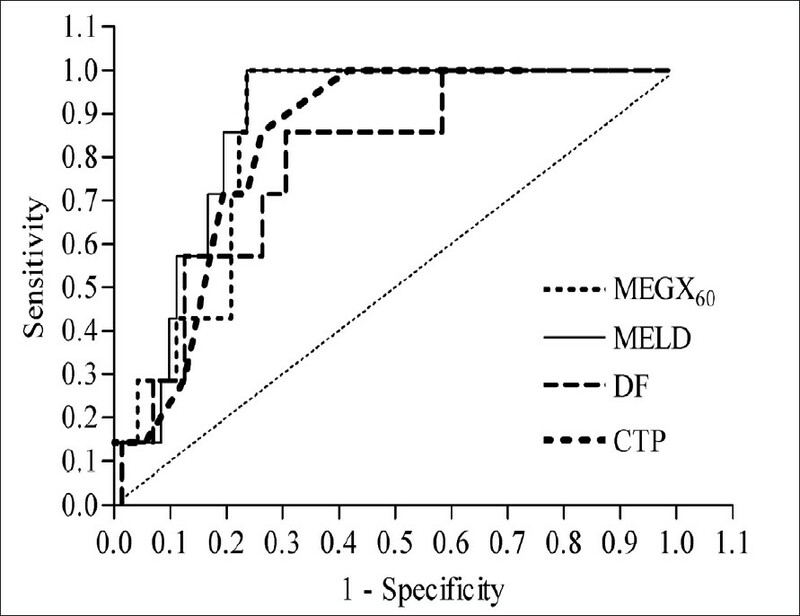 The objective of this study was to assess the prognostic value of the MEGX test in cirrhosis by comparing it with Child-Turcotte-Pugh (CTP), the Mayo end stage liver disease (MELD) and discriminant function (DF) scores. Materials and Methods: The study was carried out in Satara, India during the period of January 2005 to June 2006 and included 79 adult alcoholic cirrhotic patients. The serum specimen from each patient was analyzed using conventional LFTs and the MEGX test. The prognostic scores-CTP, MELD and DF scores were calculated and statistical analyses was performed. Results: Based on receiver operating characteristic (ROC) curves, the MELD score and MEGX 60 showed excellent sensitivity and specificity. The comparison of area under ROC curves showed that MELD and MEGX 60 had superior prognostic accuracy when compared to other scores. Kaplan-Meier survival curves for corresponding cutoff values clearly differentiated between patients with different survival times. Conclusion: The MEGX test has shown more sensitivity, specificity and accuracy than CTP and DF scores in determining cases with the possibility of three- and six-month survival. Thus, it can be concluded that MEGX test alongwith MELD, is an effective prognostic tool in the hands of clinicians for predicting short-term survival. Background: Antisecretory drugs (ASDs) are prescribed for preventing and treating nonsteriodal, antiinflammatory drug (NSAID)-induced gastrointestinal adverse effects and for stress ulcer prophylaxis (SUP). The suitability of long-term use of ASDs has been evaluated elsewhere but not in the Kingdom of Saudi Arabia (KSA). Objectives : To evaluate the improper use of pantoprazole, a proton pump inhibitor (PPI) and ranitidine, a histamine 2 (H2) receptor antagonist (H2RA); and to identify the associated factors for misuse of these two drugs at a referral hospital. Materials and Methods : In 2006, a study was carried out at a tertiary care teaching hospital in Riyadh, where patients' medical charts were evaluated for two months. All hospitalized patients on ASDs drugs, aged 18 and above were identified. A standard criterion for proper use of ASDs was applied during evaluation. Results: Of the 661 patients studied, the use of ASDs was more significant among males (57.9%) as compared to females. Proper use of ASDs show a significant increasing trend with patients' age. The use of ranitidine (56%) was significantly higher than that of pantoprazole (44%). The unjustified use of the drugs was observed in 282 (43%) patients. Improper use of the drugs decreased as duration of hospital stay lengthened. Two departments, namely medicine and surgery, were significantly associated with the prescription of the two drugs. Higher numbers of improper prescriptions of these drugs were associated with the surgery department (49.3%) than with the medicine department (38.2%). Conclusion: Improper use of ASDs was observed in 43% of the patients. Based on the results of this study, correct measures need to be implemented in order reduce the misuse of ASDs. Objective : Shigella is an important etiological agent for diarrhea and especially dysentery. Shigellosis is an intestinal infection that is a major public health problem in many developing countries. The aim of this study was to evaluate the prevalence of Shigella and its various species in diarrheal samples in Gorgan located in the north of Iran. Materials and Methods: Between January-December 2005, the epidemiology of Shigella- associated diarrhea was studied among 634 patients in Gorgan. The diarrheal samples accompanied with a questionnaire, which contained the demographic and main symptoms of the patients, were transported to the laboratory and inoculated in different culture media. Colonies suspected to be of Shigella were detected using differential biochemical tests and subsequently, the serotype of Shigella was defined using antisera. Results : Shigella was isolated from 56/634 diarrheal samples) (8.8%) of which S. sonnei was the predominant species (55%). Occurrence of Schigella was highest in the 2-5 years' age group (70.9%) and highest in summer (73.2%) with the most frequent clinical manifestation being abdominal pain (67.8%). The prevalence of Shigella in males and females was 8 and 9.8% respectively, but this difference was not statistically significant. 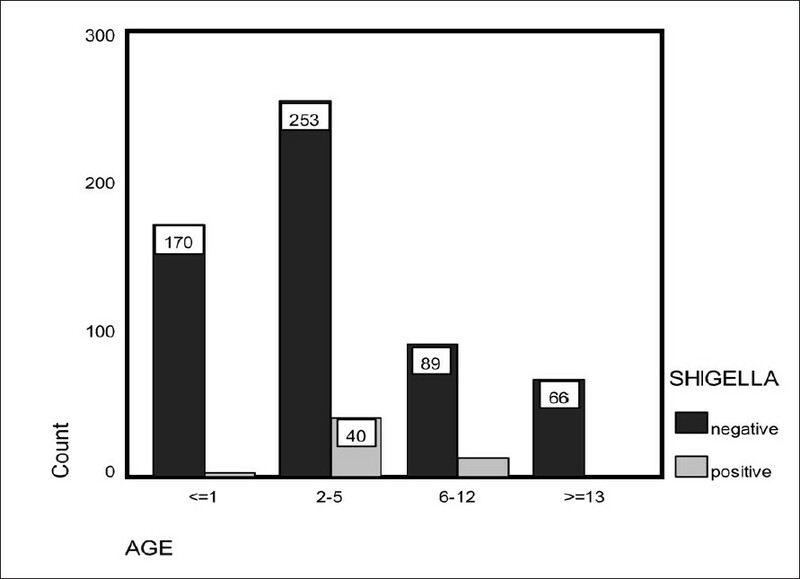 Conclusion: It has been shown that Shigella sonnei is the most common Shigella serogroup among 2-5 year-old children in Gorgan. It is therefore suggested that hygienic training be given to childcare attendants and the children themselves. Background : Tuberculosis continues to be a common disease in Iran and one of its presentations is abdominal tuberculosis. 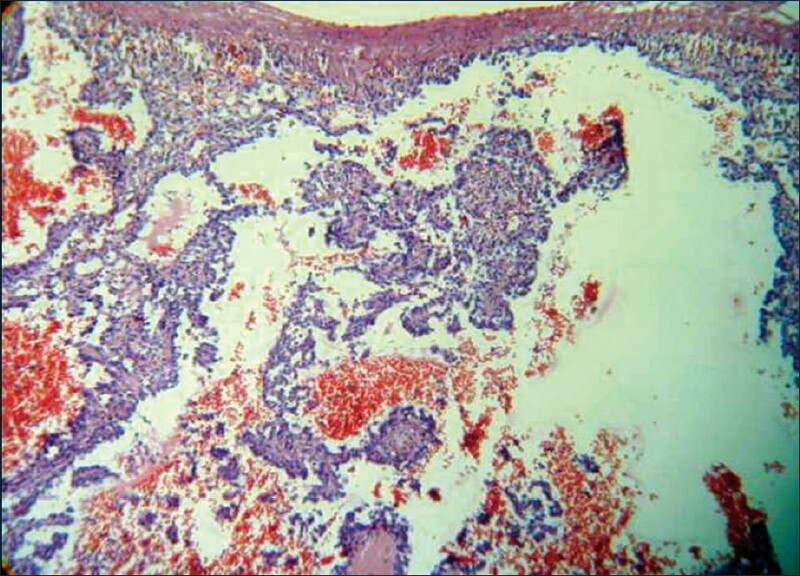 Histopathological confirmation of abdominal tuberculosis is difficult because of suboptional, noninvasive access to the pathology. Laparoscopy provides minimally invasive access to the peritoneum. AIM : The aim is to evaluate the role and importance of laparoscopy in the diagnosis of tuberculous peritonitis (TP). Materials and Methods : A retrospective study on laparoscopiy in Razi hospital of Rasht (in northern Iran) over a period of ten years showed that diagnostic laparoscopy was performed in 290 patients with abdominal pain, with or without ascites. Most cases revealed malignancy and we found 28 cases of abdominal tuberculosis. Results : Macroscopic findings of TP were whitish granulations over both peritoneal layers, inflammatory adhesions on the visceral or parietal surface, thickening, hyperemia and retraction of the greater omentum and stalactic band which is characteristic of TP. Pathology confirmed TP in 28 cases and all patients had excellent response to medical therapy. Conclusion : Although other diagnostic methods of TP such as imaging, culture of ascitis and polymerase chain reaction (PCR) are used today, laproscopy with tissue biopsy provided rapid and correct diagnosis of abdominal tuberculosis. 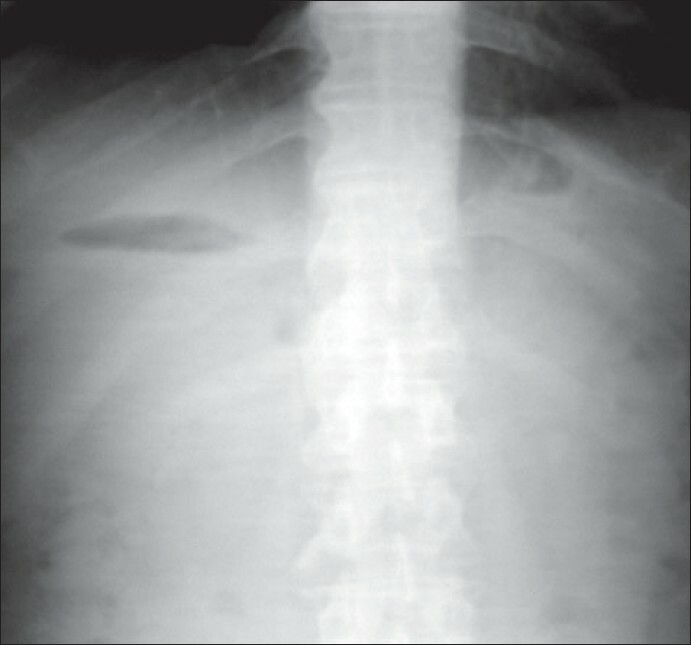 Atraumatic rupture of the spleen is an uncommon but important clinical entity. The diagnosis is often missed due to the absence of any history of trauma. Various aspects of atraumatic rupture of the spleen including those of pathologic and spontaneous rupture have been reviewed. 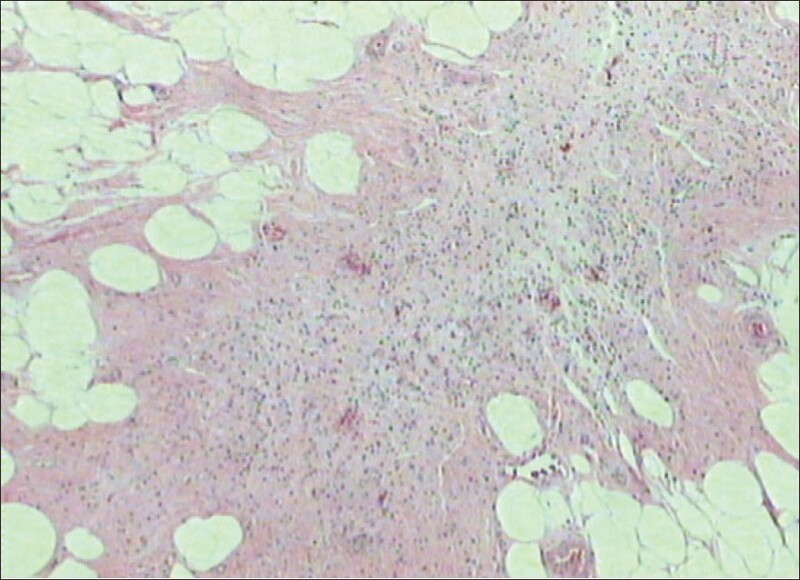 Primary angiosarcoma of the spleen is a very rare neoplasm with disastrous prognosis. Increased awareness of this condition would enhance early diagnosis and effective treatment. Chicken pox is a highly contagious infection, caused by the varicella zoster virus. Although generally a benign, self-limited disease, varicella may be associated with serious complications especially in adults. We present acute pancreatitis- a rare complication, in otherwise healthy patients suffering from chicken pox. The presence of pancreatitis in association with chickenpox in immunocompetent patients can influence the outcome of the latter. This interesting case will hopefully increase awareness about this complication and its fatality in chicken pox. Internal hernia may be either congenital or acquired. Its incidence has been reported to be 1-2%. Herniation may be persistent or intermittent. Internal hernia is a rare cause of small bowel obstruction with a reported incidence of 0.2-0.9%. The most common type is paraduodenal. Less common types include mesocolic hernia, which occurs following abdominal surgery. We report mesocolic hernias in two young patients, which presented as small bowel obstruction without any prior abdominal surgery. 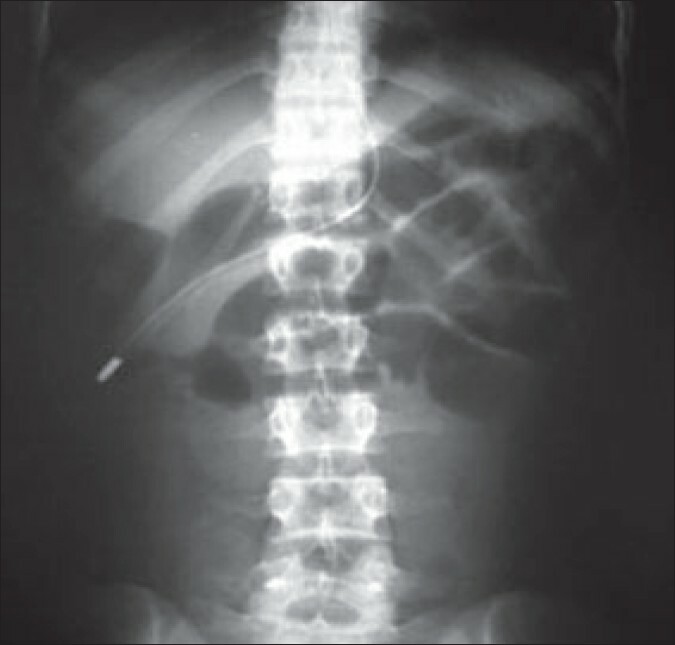 Torsion of the greater omentum is a rare condition with symptoms resemble those of acute appendicitis and is infrequently diagnosed preoperatively. Treatment is surgical excision. Laparoscopic approach is an excellent diagnostic and therapeutic tool. Determination of the extent of progress of hepatic fibrosis is important in clinical practice, where it may reflect the severity of liver disease and predict response to treatment. Percutaneous liver biopsy is the gold standard for grading and staging of liver disease. However, liver biopsy is an invasive procedure with certain unavoidable risks and complications. Several methods have been studied in an attempt to reach a diagnosis of cirrhosis by noninvasive means. Fibroscan® has been designed to quantify liver fibrosis by means of elastography and found to have reasonably good sensitivity and specificity patterns, especially in patients with advanced fibrosis and can be used as an alternative to liver biopsy. In recent years, novel insights have been gained into the role of bacterial microflora in health and disease. Commensal flora manipulation by probiotic bacteria has been investigated in human and experimental inflammatory bowel disease. Various probiotic species have shown promise in the treatment of ulcerative colitis, Crohn's disease and pouchitis in small studies, although a clear clinical benefit remains to be established.